June | 2013 | Brand On! >Note: This is a guest column by Matthew Lesko. Matthew is a New York Times Best Selling author and entrepreneur. He’s written over 100 books and is a past columnist for Good Housekeeping Magazine, The New York Times Syndicate and The Chicago Tribune. I once read that Stephen King blasts heavy metal music when he writes. Me? I can’t do that. I generally like it to be very quiet when I’m working. The exception was when I was co-founder at carbonhouse and we used to play tunes throughout the office all day. I got used to it after awhile. Plus my business partner at the time had excellent taste in music. After giving these sites below some time, I’m starting to come back around to the idea of listening and working simultaneously. What about you? What gets you in a more creative and productive frame at work? Do you think you somehow are more energized and creative working in a crowded coffeehouse? You might be right! But for those times you can’t camp out at Starbucks, there’s Coffitivity. This is a website, brilliantly named, that plays the background noise of a coffee shop, complete with clicking cups and tinkling forks on plates and the murmurs of that guy over there who is hogging the closest outlet. 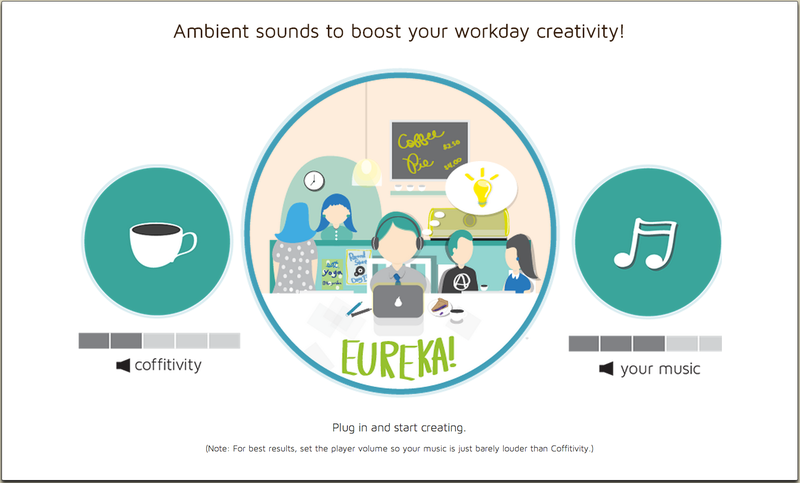 Coffitivity points to ponderous research on the positive affects of ambient noise on creativity. So…it sounds plausible. At first, I thought, why just a website and not an app? But the great thing is, you can play Coffitivity in the background and music on top of it if you’d like—from, say, Spotify or your iTunes library. I kind of forgot about Coffitivity running one day when I was listening to a podcast and wondered, why did the guy record this episode in such a crowded place? D’oh! Another Chai Tea Latte, please! The idea behind Focus@Will is based on neuroscience to help you increase your attention span up to 400% when working. You start by picking a style of music, ranging from Ambient to Cinematic; there are currently seven to choose from. Then, set a timer for 1-240 minutes—the default is 100 minutes. Turn the volume down to where you hear the music but it’s not distracting. As you work, if a certain song pulls your attention away, skip to another one. The point is for the music to be part of your working background, not annoying. After you have been playing music for more than 25 minutes in either a timed or un-timed session, when you press the pause/stop button, a productivity survey pops up. It asks you to rate how productive your last session was. According to the company, research has shown that this data is “surprisingly accurate” when captured in the moment. Your session information is added to a Productivity Tracker screen. The screen displays seven days of data, allowing you can see what your focus patterns look like and when you are most and least productive. 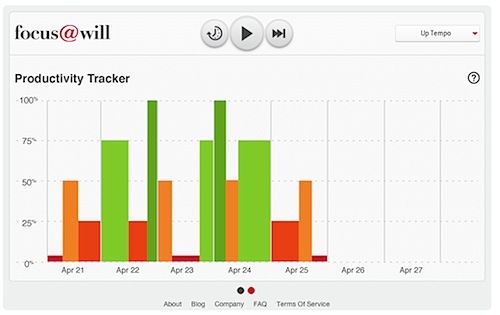 As Focus@Will gathers feedback from users, they will introduce new features around this functionality. Focus@Will works with Mac and Windows desktop/laptop browsers. There are also apps for Android and iOS. Cost: Use it free for 100 minutes at a time, as much as you like. Every 100 minutes, the music will stop and a “nag” screen will appear. They offer unlimited access for $3.99/month. Songza is one of my favorite online music platforms. 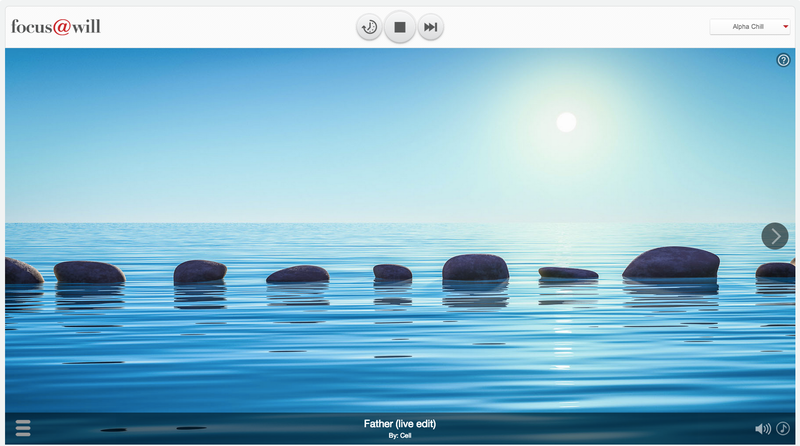 It works off the premise of their “music concierge” that curates millions of songs for you. Simply by picking a day of the week, time of day and a certain mood you’re in, Songza will present different selections of music to choose from. I use Songza to discover a lot of new music. Much like Pandora, you can listen and rate songs (thumbs up or down). My only complaint is that you can’t come back to songs you’ve liked after you leave a listening session. However, you can save and share your favorite “concierged” playlists. You can also make your own playlist. To start, you’ll have to add 20 songs by at least eight different artists. This is a neat way to share some tunes that relate to your profession or one of your passions! 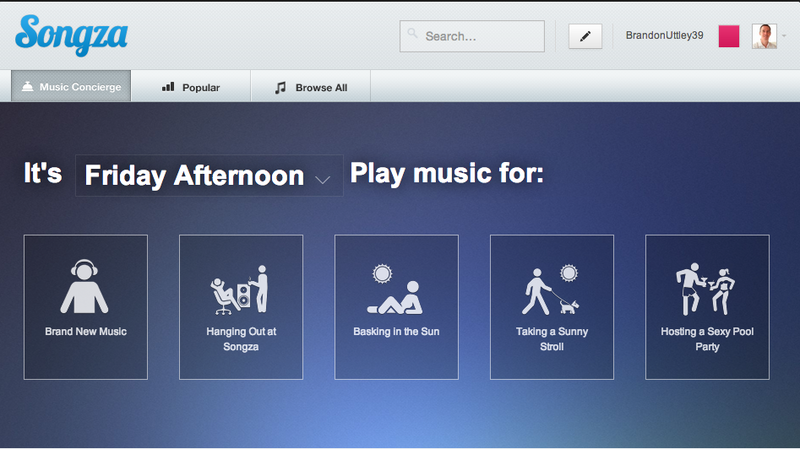 Songza is available on the Web as well as app for iPhone, Android and Kindle Fire. Cost: Free with unlimited listening. I love apps for taking notes. But after adopting Evernote and Simplenote/Notational Velocity as my primary digital note taking platforms, I thought there was no room (or need) for anything else. But a friend told me about Drafts. I’d heard about it but thought it was yet another digital note taking app. Wow, was I wrong! Drafts is deceptively simple yet powerful. Consider it like a launching base for sending your information elsewhere. 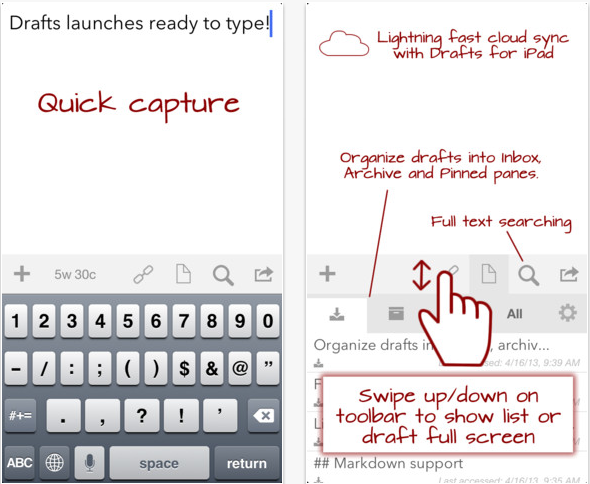 First, Drafts launches lightning-fast on my iPhone and straight into note-taking mode. It is much faster to launch and start typing a note here than in, say, Evernote. Second, it allows you to send a note from the Drafts app to other apps such as Dropbox, Evernote, email, SMS messages and more. If you are thinking (like I did at first), “Why would I want to do that?”—just use it awhile and it will start to make perfect sense. You’ll wonder how you ever lived without it. The Drafts website has a ton of “Actions” that you can grab to customize your own Drafts app. One of my favorites is appending new text to an existing Evernote file. For HTML geeks, Drafts also supports Markdown code. After trying Drafts, it earned a coveted spot on my iPhone’s launch bar. I use it all the time now to capture information on the go.